Rising from the waters of the Laguna Veneta, Venice has long - and rightly - been regarded as one of the world's most beautiful cities. Napoleon, who had an eye for acquisitions, once described St. Mark's Square as the finest drawing room in Europe. 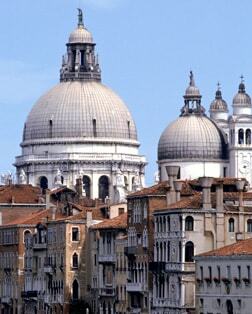 Certainly, no other site can quite match its superb campanile, Doge's Palace and recumbent lions. Just over two miles in length, the Grand Canal is lined with stunning buildings that reflect the city's unique heritage. Cruise through its winding canals on a gondola or watch the bronze Moors on the clock tower strike the passing hours as they have for 500 years - Venice is an unparalleled experience. The city began life as a refuge from barbarian invasions. By the Crusades, Venice's dominion extended throughout the Adriatic and Mediterranean. The winged lion - symbol of St. Mark - flew over palaces and fortresses from Gibraltar to the Black Sea. A breath-taking landmark, this famous basilica is unlike any other. It's adorned with golden facade mosaics, marble and bronze statues, five domes, and spectacular city views from the bell tower. Perhaps the city's most famous symbol of Venice's culture, this magnificent 14th century palace was the seat of power and the palace of justice. The Bridge of Sighs was built to link it to the prison. This busy water way is lined with 170 buildings dating between the 13th to 17th centuries. Murano Island has been the place for Venetian glassworks since 1291. In Saint Mark's area, You'll get to see the craft and examine some of the exquisite works for yourself as you tour one of the leading glass showrooms. This is the ultimate Venetian experience. Traditionally clad gondoliers pilot you along the some of the Floating City's inner waterways crossed with scores of ancient stone bridges. The 16th century Church and monastery is considered one of architect Andrea Palladio's masterpieces. It boasts two of Tintoretto's greatest works: "The Last Supper" and "The Gathering of the Manna." It is one of the most famous theatres in Europe, the site of many famous operatic premieres. Like the Phoenix for which the theatre is named, Teatro La Fenice finally rose from the ashes in November 2004. Following a devastating fire in 1996 that nearly burned the famous opera house to the ground, massive reconstruction took place to restore the theatre to its original splendor. Known worldwide for its dramatic beauty, La Fenice is also known for being the cradle of many great operas. The quaint fishing village with its streets lined with brightly colored houses and small shops, is revered for its lace making, a Venetian specialty.